OKC.NET | Silo Art Project: OKC Let’s Kick Start This! Silo Art Project: OKC Let’s Kick Start This! Rick Sinnett is no stranger to Kickstarter. He’s used the social media meets private-funding platform to successfully launch a public art project to beautify Route 66. After finding citizens had been willing to back “Guardian of the Mother Road,” located in El Reno and the second in a series of eleven planned murals, Sinnett has chosen to once again use Kickstarter to move forward on another public art project located right here in Oklahoma City. Computer generated rendering of what the completed project will look like. According to the Kickstarter campaign: ” ‘This Land,’ is a youthful, vibrant, and encouraging representation of Oklahoma icons. The American bison, the scissortail flycatcher, Indian paintbrush flowers, wheat, the earth below, sun beams radiating overhead and the Oklahoma River – each figure speaks to an element of Oklahoma and our land.” Photo courtesy of Silo Art Project. 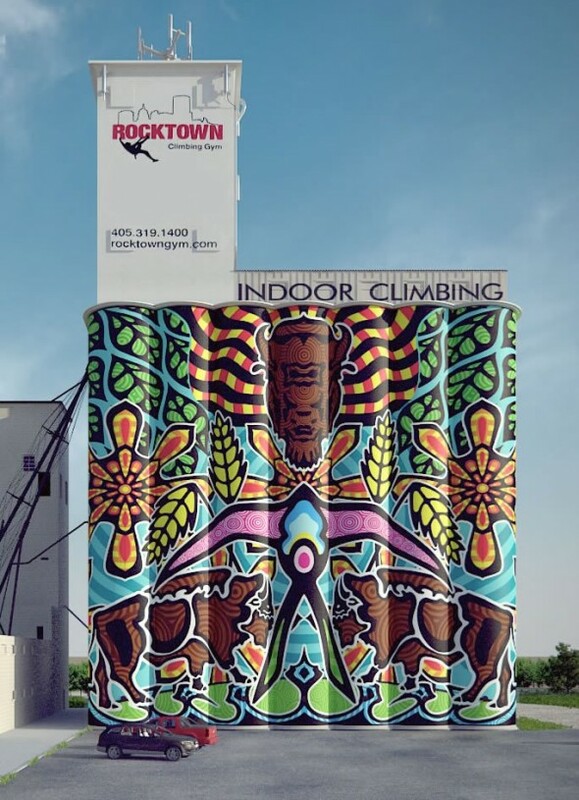 Initially “This Land,” the mural intended for Rocktown Climbing Gym’s grain silos, had sizable corporate backing. And while the project was green-lit in 2012 by the Oklahoma City Arts Council, it was decided corporate logos would be removed from the final picture. Sinnett said this decision caused the primary corporate entity to reconsider its sponsorship, which then led to a withdrawal of its financial support. Not to be deterred, Sinett said the financial loss spurred him to get creative and find alternative ways to secure the resources needed to finish the mural. When I asked Sinnett what a working artist earning a fair wage would charge for a mural of these proportions, which for the record is 100 ft x 128 ft, he said for time, materials, and level of experience it would run about $330,000. But the reality is Oklahoma City may get this public art for a fraction of the working-wage estimate. Sinnett believes, excluding the cost of labor as he is donating his time, it will take close to $70,000 to get “This Land” painted on the Rocktown grain silos. A large portion has been sponsored by donations from S&S Promotions, Digital Media Warehouse, H-I-S Paint, The Red Cup, Funnel Design Group, and Rocktown Climbing Gym. Even with all the help, Sinnett knows he needs another $16,000 in projected equipment costs to see the mural through to completion. While he has been using rock climbing equipment to start prep work, he will need professional scaffolding and lifts to apply the stencils and paint in the design. 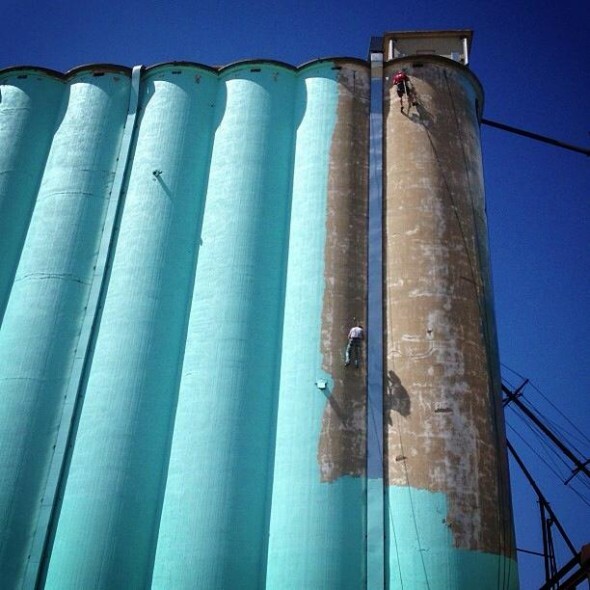 The extent of Silo Art Project’s progress as of April 30th. Photo courtesy of Rick Sinnett. I think it’s also worth noting that Sinnett said he wasn’t one for rock climbing before this endeavor, but with the help of experienced rock climbers he’s gotten the hang of being suspended that high up in the air. However, with Oklahoma’s sweeping winds and variable weather conditions, scaffolds and lifts are vital to the project’s success. To that end, Oklahoma’s summer heat is another reason Sinnett chose to go the Kickstarter route. Rather than apply for public arts funding, that could potentially take a few months or longer for review and approval, Sinnett hopes that in raising the final $16,000 by the end of his Kickstarter campaign, he can complete the entire project before temperatures reach triple digits. Not familiar with Kickstarter? Don’t worry. It’s really easy. You can pledge a desired amount after you register to create a profile for yourself. If the project makes the monetary goal by the deadline, then you are charged the pledge amount. If it doesn’t make the goal, then no funds are withdrawn from your account. Have I pledged? Yes. The potential I see is a future where families and friends take pictures together with this mural as a backdrop. They’ll post these pictures to their social network of choice and if it is a really special memory, they’ll get their portraits printed and framed. Regardless of where they come from, residents or visitors, I find it heartening to think these unique memories will be made exclusively here in Oklahoma City. I’ve also Kickstarted various projects in the past. They don’t always make it, but the lovely thing about Kickstarter, from the user’s perspective, is that you get the opportunity to fund something really neat and there is the potential for bonus swag too. In the case of limited items, the earlier you pledge the better your odds of nabbing the swag you want. For the Silo Art Project, Sinnett is offering various tiers of goodies so there’s something for every budget. It bears mentioning that pledges under $10 do not have a tier that includes reward incentives. But even if someone can only donate a dollar, it is very much appreciated by Sinnett as his goal all along is to make art for the people. Still having watched Kickstarter campaigns in the past, I’ve seen projects earn over their goal amount. Sinnett said any extra funds beyond the $16,000 will be put towards the next public art mural, which will be located in Arcadia, Oklahoma. Sinnett is passionate about public art because he loves the process by which a community takes ownership of a mural, from onlookers watching as it develops to citizens thinking of it as theirs by the time it is done. You can learn more about the Kickstarter campaign via the video. To go directly to the campaign visit: Silo Art Project. If you’re really fired up, you can follow the Silo Art Project’s Facebook page to catch more updates or follow it on Twitter. Tagged Arron Gibson, Digital Media Warehouse, Funnel Design Group, Kickstarter, Oklahoma City, PR, Rick Sinnett, Rocktown Climbing Gym, Silo Art Project, Silo Art Project Facebook, Thomas Surratt, Twitter. Bookmark the permalink.